ARCATA, Calif— The redwood forest, despite being populated by the largest trees on Earth, feels surprisingly cozy. Everything is a lush green or deep black brown and the air smells fresh and clean. It’s a far cry from Miami, with its bright sun, sand and vibrant city vibes. In Northern California, time feels like it’s moving slower, and life seems calmer. Click on the video at right to view an audio slideshow about endangered redwoods in Northern California prepared by writer Shivani Aluru. The fantasy setting comparison is appropriate considering that Sequoia trees can grow up to 250 feet tall with diameters about 30 feet wide, according to Farryn Thomas an assistant ranger in Orick, Calif. Currently the redwood tree family is endangered, including the coastal redwood Sequoia sempervirens, a species that is typically found up and down the length of the Pacific Northwest. The International Union for the Conservation of Nature (IUCN) declared the coast redwood endangered in 2013, a mere seven years after the coast redwood was declared a vulnerable species. 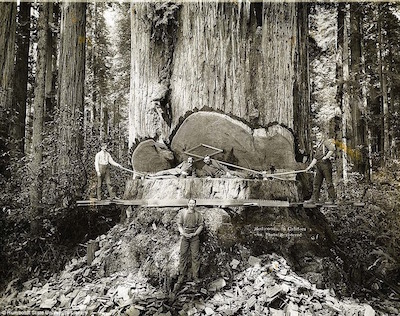 Stephen Sillett, a professor of redwood forest ecology at Humboldt State University, noted that redwood trees, due to their size, are difficult to restore simply because it takes hundreds of years for the trees to fully mature. His research from 2009 on coastal redwoods illustrates the physiological difference between redwoods based on their height. Intuitively, shorter trees struggle for sunlight beneath larger ones, while taller trees need to develop mechanisms to draw nutrients upward from the ground. 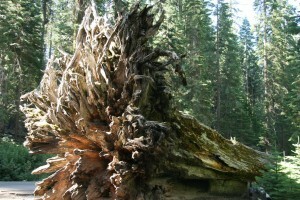 Fully matured trees from redwood seeds are less common compared to shoots that grow off of logged redwood stumps. Unfortunately, it’s common for ground seedlings and smaller saplings to get trampled by both park visitors and wildlife, making it difficult for fledgling redwoods to grow from the ground up. A fallen redwood becomes a sapling nursery, home to shoots that will eventually grow into new trees (Photo by Kevin Casper). According to ­­Martin Diaz, a volunteer with Save the Redwoods League, many redwood forests actually suffer from overcrowding and improper replanting efforts by timber companies. “In order to legally operate, logging companies were required by state and national law to replant the same number of viable trees as they cut down. Unfortunately they didn’t really have the knowledge to plant the trees properly and have done somewhat more harm than good,” Diaz stated. Pascal Berrill, an assistant professor of silviculture and restoration at Humboldt State University, noted that the current practices of fire prevention are actually hurting redwood forests. Redwood trees are actually fairly fire-resistant and benefit from natural forest fires because they typically wipe away plants that crowd the forest floor and prevent the spread of invasive species that crowd young Redwoods out. In Humboldt County several hundred acres of redwood forests belong to private entities —either people or companies, and this land is regularly subjected to logging, the most basic and ubiquitous reason for redwood deforestation. However, moves are being made by non-profits like the Save the Redwoods League and a variety of individuals to reclaim the land as public property and subject it to the environmental protection laws that the majority of parks, both county and state, in the area fall under. Loggers pose for a photo in the middle of cutting down a sequoia tree in 1912 (Photo courtesy of the Humboldt State University Library). By slowly buying back forestland, those interested in preservation and restoration can begin correcting human damage and steering forests back to their natural state. Park superintendents, like Dan Diemer with the City of Arcata Parks Division, often coordinate efforts by non-profits and work beside them to help with park maintenance. Nearly all of Arcata’s parks are home to coastal redwoods and a lot of effort goes into their care. The City of Arcata Parks Division maintains each recreation area without the use of pesticides and often works with researchers and environmentalists in the area to monitor redwood growth and mortality. The parks department is open to volunteers joining the effort for a day in order to do everything from cleaning up playgrounds to weeding overgrown areas. Lee Auerhan, a native to the Humboldt County area has often volunteered. “Being around these trees always made me feel small, and there’s nothing that brings me closer to the ground than visiting the parks and hiking through the woods. Even though it’s been decades most of the parks still look the same,” she stated. 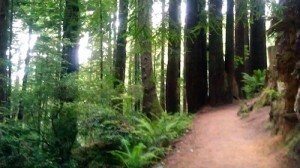 A hiking trail in Arcata Redwood Park (Photo by Shivani Aluru). Redwood forests are a part of the Pacific NW/NorCal lifestyle, to the point where there is a very clear symbiosis between residents of the area and the forest parks they frequent. Though the return of the coastal redwood to its former glory will take hundreds of years the area is in good hands, with everyone from government leaders to school children invested in the return of the redwood.